I know what you are thinking. Yup, that movie is really cool. The battle scenes are awesome. The fighting skills are great. And the Queen is so pretty and wise. 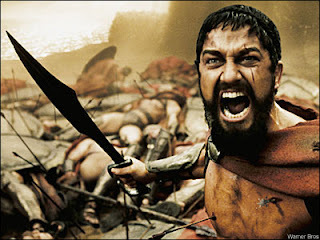 But I’m not going to discuss about how those 300 Spartan soldiers fought for their country in Battle of Thermophylae. 300 here is the number of hours in the lab that I’m planning to do before I take my CCIE lab. Why 300? Same reason with King Leonidas, I guess. Or maybe it’s because I spent about 900 hours practicing in the lab for my first CCIE. And for the second, about 600 hours. Now I’m going for my third CCIE, and looking at the pattern I told myself I need to do at least 300 hours. The key here is to fully utilize the weekend. 5 hours a day means 35 hours a week. If I can do even only 2 hours lab during working day, I still have 2 days in the weekend where I can lab for 12 hours a day. So when is the time for social life? Uhm.. what is that, anyway? My only challenge is with the frequent flyer life style. My lab is located somewhere in Cisco internal network so when I travel sometime I don’t get Internet connection to access them. Or the Internet might be very slow. Traveling also means it’s difficult to bring the books along since they are heavy. And I really don’t like to read from my notebook. Fear not, I got the Internetwork Expert Advanced Technology class-on-demand for CCIE SP recorded as .avi file that I can play in my Creative Zen Vison W. So everytime I have spare time but no access to my lab, I can listen to the Two Brians explaining the SP technologies. Even the Zen screen is small, I still can see the command typed in the video. And just FYI, Zen has a slot to plug the CF card from my digital camera. Yeah, vote Zen for CCIE-wannabe-that-must-travel-all-the-time! I have to admit that many times I was tempted to delay my lab date. But then I told my self, if I delay this once I may do it again and again later. So no more excuse, I will do it in the next 60 days. Unless for some reason I don’t get the Schengen Visa to go to Brussels or my company asks me not to go. have you tried the Creative Zen W player with CBT Nuggets videos? I'm planning to study also in spare time during day like lunch breaks, train travels etc. I'm running for CCSP/CCNP and you're a big source of inspiration and motivation! Your posts are pure philosofy! Thanks a lot, you're great! If you ever come to Italy I've a free room and beer for you.